Someone must be telling Kevin Plank he needs to do something with his wealth. In the past year, the billionaire CEO of Under Armour (UA) has invested in a Maryland watch company, Towson Watch Co., and a Maryland salad-dressing company, Tessemae’s, both through Sagamore Ventures, the venture capital arm of his holding company Plank Industries. He opened up an innovation center, City Garage, in a former bus depot in Port Covington, Md. And on Wednesday at City Garage, Plank will hold a “barrel dump” launch event for Sagamore Spirit, an 83-proof rye whiskey made with water from his farm. The liquor goes on sale on May 13. 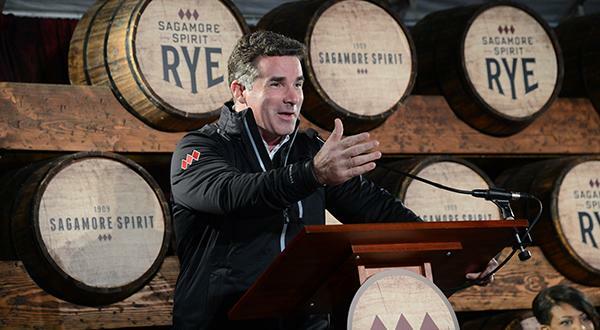 Sagamore Spirit is not part of Under Armour, but it is part of Plank’s sprawling project in Port Covington, where a five-acre whiskey distillery will open next year along with Under Armour’s new global headquarters. The total size of Under Armour’s project in Port Covington amounts to 260 acres. The whiskey label is also part of an effort to promote the 530-acre farm, in Glyndon, Md., that Plank purchased in 2007. Sagamore Farm was once owned by the Vanderbilt family; Now it’s an extension of Plank’s gritty, sporty entrepreneurial empire. Plank raises and trains race horses at the farm—one of them, named Shared Account, won a race at the 2010 Breeders’ Cup at Churchill Downs—and now he provides water for whiskey, too. Although the whiskey isn’t being distilled at Sagamore Farm, the whiskey is made with spring-fed water from the farm, which sits on a limestone shelf. Until the Port Covington distillery opens, the rye is being distilled in Indiana. Once the Port Covington distillery opens, it will offer tours and tastings to the public. Plank’s co-founder in the alcohol adventure is his childhood friend Bill McDermond, who played football with him at Fork Union Military Academy, then played at Vanderbilt University while Plank played at Maryland, and then came to work with Plank at Under Armour in an operations capacity before leaving in 2009. The idea for the whiskey, McDermond tells Yahoo Finance, came around back in 2011. “Kevin had been approached several times to grow grapes or start a vineyard up on his farm,” McDermond says. “And he told me one night, ‘I’m not really a wine guy, but I certainly would be interested in whiskey. Do you have any interest in looking at it?’” McDermond did his homework and realized the limestone beneath the farm, from which an aquifer was filtering water into a spring house built in 1909, would be well-suited to use for rye whiskey. “We got into this with the idea that, there’s this category called rye whiskey,” McDermond says, “And we didn’t feel anybody was paying attention to it.” That’s not entirely true. Rye whiskey has made a very public resurgence in recent years, especially from Kentucky, but trend or no trend, Sagamore Spirit will benefit from an association with Under Armour, even if the label has nary a name-drop. Plank is known to approach every business venture, whether it is a new product line at Under Armour or sponsoring an entrepreneur pitch contest at his alma mater, with great seriousness. For Sagamore Spirit, he brought on a lead distiller who had previously worked for Seagram’s. Plank declined to comment for this story. McDermond describes the product as a smooth, spicy “sippin’ whiskey,” and says one of the brand’s goals is to appeal to women. It will retail at $40 for a 750ml bottle (the only size, at first), and only in Maryland and Washington, D.C.-area liquor stores and bars. Under Armour devotees can sip some of the Maryland rye while wearing their favorite Maryland apparel brand. Just don’t drink it before going running. Yahoo Finance Sportsbook is our new video series on the business of sports. Join the conversation on social media with the hashtag #yfsportsbook.